CBC is really the last frontier for relatively good rock radio on terrestrial radio in Canada. Strombo for example is not bound by labels such as alternative or classic rock etc. The adult alternative programs on the station are also better than any other offering on the Toronto rock dial during the drive time slots but I think they need to broaden their playlist and add more selections from rock music's long and rich heritage. Randy Bachman's Vinyl Tap has some interesting themes and mix of different types of rock. I usually only listen to terrestrial radio in the car these days due to the lack of quality but I was in the car yesterday afternoon and tuned into psyche Sunday on Q107 and noticed a slight shift there. Seemed like Andy Frost was playing a few deeper cut tracks and later in the day I heard Ballad of a Thin Man ( something is happening here and you don't know what it is do you Mr. Jones) by Dylan and not the usual Like a Rolling Stone or Knockin on Heavens Door. Also Wild Mountain Honey by the Steve Miller Band vs the usual Joker or Jet Airliner etc. Hopefully a broadening of their playlist will continue and maybe something is happening there. There have been some minor tweeks at Radio 2 with music lately, notably the PM drive show tagging itself as the classic you love, the new music you need. They've added a fair bit of classic alternative you didn't hear otherwise. The biggest problem with Radio 2 is people forget it & it's got a bunch of classical in the daytime. Why is public radio in Canadian focused on playing dead Europeans? Strombo's show's been a fav of mine for years. The magnificent 7 is a great way to discover new music you won't hear elsewhere. He also doesn't stick to a rigid format so it appeals to real music fans. And if I recall he's long called it "the spirit of radio". I used to wonder what Corus would have to say about that (assuming they own the trademark). If a CBC'er is reading this I have a question. I used to commute via car between Calgary and Vancouver. Just pass Rogers Pass heading toward Golden, BC, I'd always pick up his show on CBC. It would fade away about 20 kms outside Golden (going East). What repeater is this? I could never figure it out and it seemed like it came from a distance. Nothing says Canada like driving on a desolate mountain road, in 15 feet of snow, listening to CBC. @Irvine. I don't believe anyone has the Spirit of Radio copyright. BTW David Marsden before his time with CHUM FM worked at Montreal Free Form station CHOM FM (originally CKGM FM) and that was called "The Spirit of Montreal" and they actually kept the free form spirit alive for longer than CHUM FM. I still remember driving in Montreal in 1976 and surprised to hear Brian Eno and a track from his album "Taking Tiger Mountain by Strategy". There is no way CHUM FM would have touched that by 1976. Vancouver had a "Spirit of Radio" as well, only it was on an AM frequently. I believe Marsden applied to move it to FM but it didn't happen. Ironic really given that in Vancouver you can hear 107,7 The End Seattle, The Zone 91.3 Victoria, Peak 102.7, CBC Radio 2 (with good ratings) and for some time there was a station called Shore 104 which was indie. To add to that Whistler FM, a very indie music station has applied for a transmitter in Vancouver. On a side note, interesting to note that in the UK "digital" listening now beats over the air listening. Not that it's a surprise or anything. The UK seemed to focus on nurturing radio (like tech firms nurture new ideas) and it worked. North American radio & TV did the opposite. Shore 104 actually started as decent Adult Alternative station mixing classic rock, R&B and alternative.They kept the adult alternation label but near the end had a format somewhat similar to Indie 88.1. In fact there was a time that Vancouver had two stations that were calling themselves Triple A but were both in fact just a variation of Indie type programming which often sounds like a farm club for Edge 102.1 and generally uninteresting to my ears. BTW yesterday when I was listening to Q 107 I heard : A) nice new jingle for psyche Sunday and B) An ad where Imagine Dragons were mentioned as an example of the new music they are now playing. I'd argue that Vancouver's "The Peak 102.7" is a far superior radio station than anything 102.1 has did in years. They were quick on UK stuff like Hozier & Ed Sheeran. They've also did a great job with new Canadian music. Said the Whale, Current Swell, Jon and Roy & Jet's Overhead (Headed to Nowhere) comes to mind. The real strength of Peak 102.7 is the on air staff. They took a chance with a morning crew out of Kelowna who are excellent (Kevin & Sonia). The other hosts (referred to as people on the website) are topical but intelligent. I don't feel my IQ shrinking when I listen to the station. The station makes an effort to reflect the cultural diversity of Vancouver with Asian/South Asian announcers. And, a while ago they aired an attack ad from the Conservatives which the station pulled because it didn't fit on the station & people apparently complained. As far as I know the guy who built Shore 104 up (and then sold it) is the owner of Whistler FM in Whistler BC. It's a rather diverse station & is very focused on local. Shore 104 WAS a good station but it was in a market with a lot of competition & had a small signal. You're talking mountains, dial congestion and, in central Vancouver, a lot of concrete. My own neighborhood (West End) has a population density of Manhattan. If Corus is going to add Imagine Dragons to Q107 well they've lost their mind LOL. Like my comment or not "rock fans" tend to be rather snobbish about their music. They're reticent to try out anything new & if they do like something new it sounds like something old (think the Sheepdogs). The odd song at times might cross over on CFNY & Q107 but it's rare. The only time it really happened was when Live Earl Jive was fired by CFNY and hired by Q107. It was the most interesting Top 10 at 10 in the history of Q107. I was not playing full attention to the Q ad where Imagine Dragons were mentioned but to be fair to them I think it was a vote for the new music you would like to hear or some such. Since the new Q format there is a bit of overlap with the Edge. Red Hot Chili Peppers, Nirvana and yes The Sheepdogs and a few others. I'm presuming that both Stations are overplaying the Tragically Hip. Most of what Q seems to sell as "newer rock" isn't new at all. Bands like Nirvana or RHCP are way past their shelf life & most of their better material is from the 90's. K97 Edmonton, a heritage classic rocker has added a few grunge songs but it's only the well known cuts. I personally don't want to hear burned out 90's rock stuff anymore. Yeah, I really liked Nirvana, RHCP and even Tragically Hip. In 1993. In 2015, I want to hear something different. That's why I like Peak 102.7 because it's mostly newer music. And when I grow tired of that I'm far more likely to tune into a Top 40 station, especially Hot 107 Edmonton. I believe the whole "rock snob" thing is a major issue with rock radio. There is a sense of superiority with rock music fans. A sort of "my generation of music is better". I see it all the time on social media. It's become generational and that makes it very difficult to program rock radio. 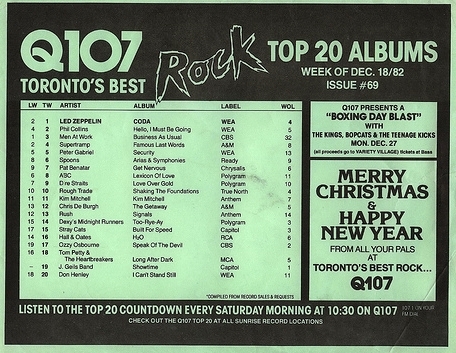 What's interesting about q107 is that back in the mid 80's it was a pretty "wide bodied" format as far as rock goes. I can remember Platinum Blonde being in high rotation on Q107. I even have a cassette someplace of The Top 10 at 10 with Walking on Sunshine - Katrina & the Waves being played. Go find old Q107 playlists and The Spoons & Ozzy are on the same page.